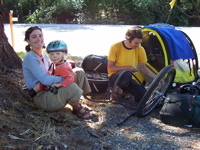 For the time we stayed in Mill Valley and waited for that special piece to fit the trailer to Flo’s bike, Becky had lent us her car. This made it a lot easier for us to get arround. Public transportation in Marin County is very time consuming, thus not very efficient. Peggy had invited us to come up to their farm in Middletown for te weekend. 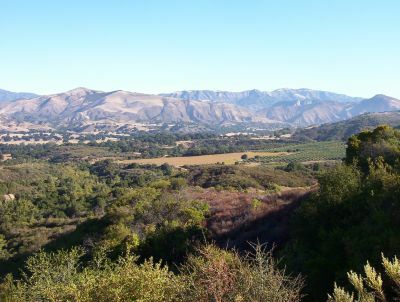 So we drove up through the Californian vine country: Blue skies over hilly vineyards lined with light scattered forests, tree leaves changing to red and yellow colours and over it all the heavy sweet smell of ripe grapes. Chan loved the farm as soon as we got there. 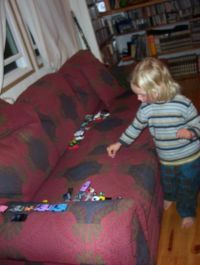 He immediatly found Theo’s old tractor and Sam brought the Brio tracks out. 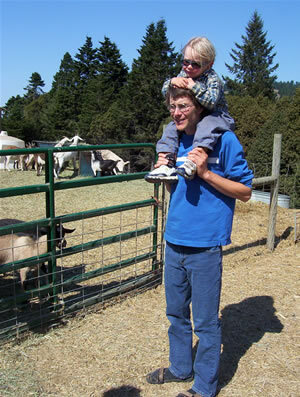 He could get close to horses and sheep for the first time and there was even a huge pig. We would have stayed for a few days, but unfortunately I got asthma due to my animal allergies. 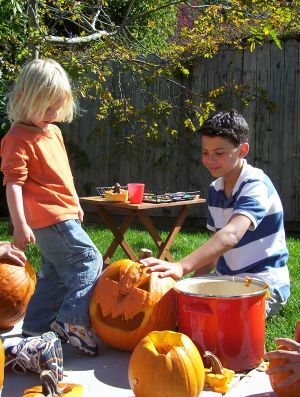 Back in Mill Valley Tyler and Theo bought Pumpkins to carve for Halloween and showed Chan how it was done. The two boys were like brothers to Chan. 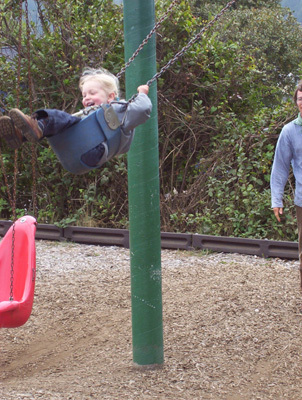 He took them by the hand and they happily played with him with cars, trains, balls and a frisbee. 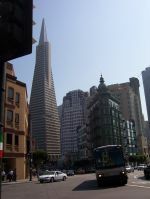 A couple more times we went down town San Francisco as tourists and met up with Becky for lunch or dinner. 2 1/2 weeks had passed too quickly and we had to say good bye to a family who had welcomed us so warmly and unconditionally. Out of shape so quickly? 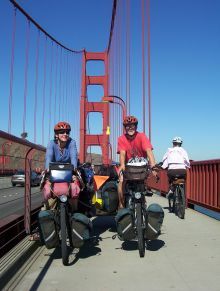 We wanted an early start to have plenty of time to ride fully packed through San Francisco, but it was noon when we finally hugged Peggy and Sam good bye (Michael and the boys were gone for the weekend). We had changed the bike seat to Florian’s bike where Chan was sitting now. I pulled the trailer for the first time. Was it the weight of the trailer or could I have gotten out of shape so quickly? My bike seemed so heavy, hard to push foreward. In Sausalito Florian took the trailer back. 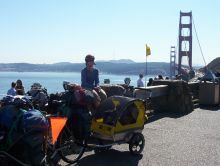 My bike still wasn’t rolling lightly and up at the Golden Gate Bridge I had to catch my breath. Florian didn’t seem to mind the climb. 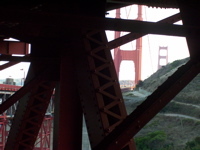 Neverthless, the feeling to be finally riding over the bridge was triumphant! We couldn’t just rush throught the city. We took the beach path with great views into the bay and had lunch at Fishermen’s Wharf. 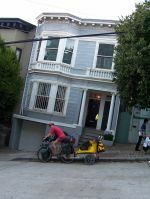 Then we rode a carfully planned route, to avoid the steepest hills, to the top of Russian Hill and the crookedest street. Florian again didn’t mind the climbs but I needed an ice cream half way up and so did Chan. We got some funny looks, when we whizzed down curve after curve. Chan loved it! Through North Beach we made our way to Becky’s work place just in time for her to get off work and hang out for a bit in a park before we headed to the close Hostel. And finally, after all that riding I found out why my bike was so heavy and I so tired: The whole day I had the rear brake rubbing against the rim! Riding out of the Bay area wasn’t as pleasant as riding in, but the shoulders were mostly good and the scenery beatiful. Just before turing for the State Park in Half Moon Bay a car stopped at the side of the road and Brenna invited us to camp in her back yard! 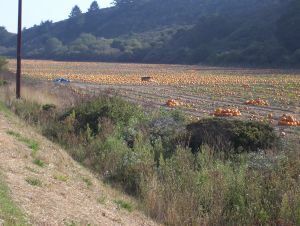 While the coast highway had been mostly lined with pumpkin fileds so far there were more and more vegetable fields now. The air was humid but warm during the day, the nights were getting a bit cool. We were now riding towards Santa Cruz. On one of the short down hills the trailer behind Flo’s bike seemed to wobble quite a bit. I told Flo so and he thought it would be a good idea to check his back wheel, since it felt so soft and wobbely that day. So we stopped in Davenport about 10 miles north of Santa Cruz. When all luggage was off the bike we could see two broken spokes and all the rest of the spokes were extremely loose! This back wheel we had put on Flo’s bike in southern Oregon and now it was broken already? Flo tightened the remaining spokes, our emergency spokes didn’t fit his new wheel! 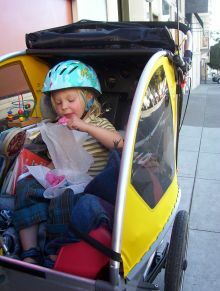 So I took as much weight as I could on my bike and the trailer and off we went to a bike shop in Santa Cruz. The two broken spokes were replaced and the wheel got centred again. By now it was pretty late and still some distance to the next campground. We also weren’t quite sure how to avoid the interstate to get out of Santa Cruz and asked a bicyclist. Ana invited us to stay with her and Allen for the night and they even had a playmate for Chan visiting! Throughout the next day the air was filled with a pleasant sweet smell. 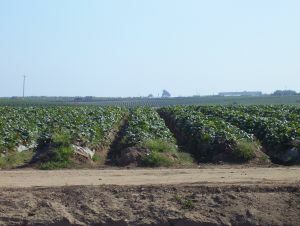 We were riding past strawberryfield after strawberryfield intermittent by artichoke or brussel sprouts fields. In Monterrey we took a day off to explore the town a bit. Once the bikes were unloaded we found yet another broken spoke on Flo’s back wheel and decided that it was better to get a new wheel. My back wheel had to be replaced as well due to some cracks in the rim. The mechanic was a member of the Aquarium and gave us free entrance to it, while he was working on our bikes. 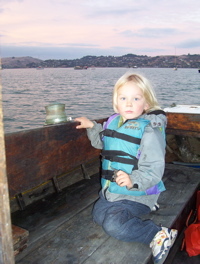 Chan had a blast touching sea cucumbers and see stars, watching see otters from very close as well as sharks, other humongous fish and jelly fish. At the hiker biker site in Monterrey Memorial Park Chan found some new friends again. The first night he went for walks with Canadian bikers on their way to San Diego and the next two nights he made friends with Andrea and Joerg from Germany. 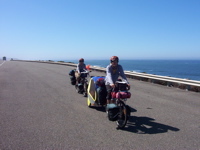 The two are on a journey from Alaska to Argentina and over the next two weeks we were camping at the same campgrounds. 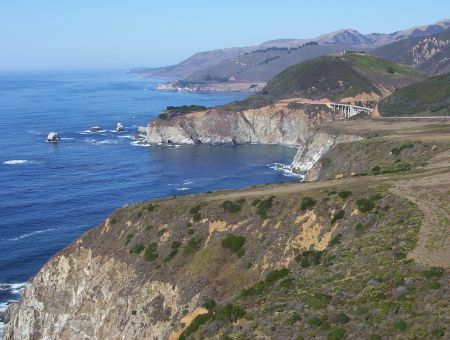 Many people had warned us about riding through Big Sur. They said there were no shoulders on a windy narrow highway and no protection from the steep cliffs. The ride was beautiful. There might not have been very good shoulders, but traffic was slow and little. There were some steep climbs but the view over this amazing landscape rewarded fully for them. The weather was as good as it could be, though a bit too hot for Chan. We still had to fit the sun deck to the new trailer, so that he had some shade. 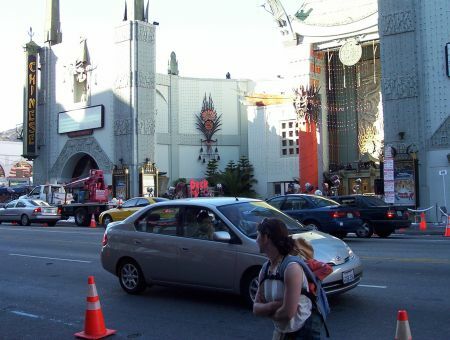 We passed some movie sets, but didn’t see any stars, just people waiting and set lunch tables. Playmates for Chan on a Big Sur Campground, and an urgent potty stop. 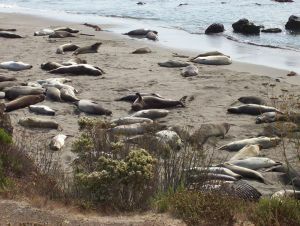 Lazy sealions by San Simeon and a bautiful scenery north of San Luis Obisbo. Then we left the “wild” coast behind us. Our route was now pretty flat so that I again took the trailer. In Morro Bay we took another day off to finally make the sundeck for the trailer work check e-mail and get our laundry done. That evening Florian came back from the library with a sad message from my father: My grandfather had had an accident and needed surgery. It wasn’t sure if he would live through the night. We would get the message a week later, that he had passed away. 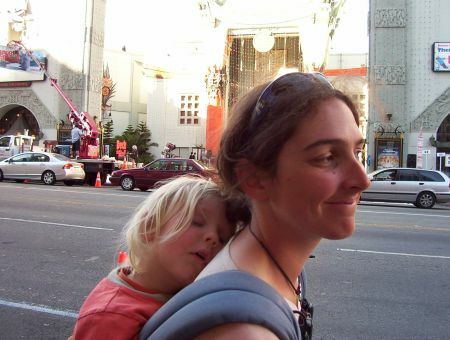 During this week I called home often, not knowing what to expect, not knowing what to do either. 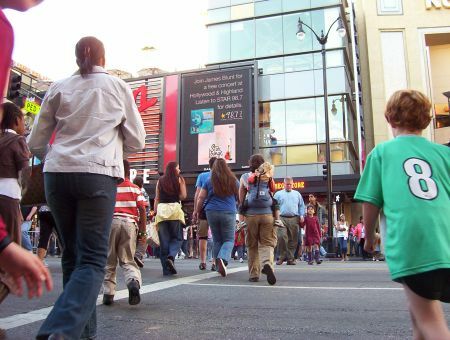 I felt an urge to go home and be with my family, I felt lonely. But at the same time Florian and I chose this journey to be our life. This is where we are now and even if we are not physically with our family we are there with our hearts. So I stayed, thinking of my grandfather often. 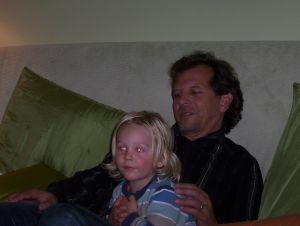 Last time I had seen him he was holding 10 month old Chan on his lap with a happy smile on his face. 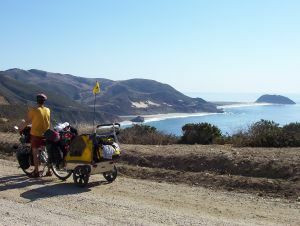 For the next few days we were glad to have directions from the book: “Cycling the Pacific Coast”. Highways got bigger and busier and it was good to find our way on back roads through endless fields of greens and cauliflower. It was harvest time. Big traktors with wagons were on the fields, mexican workers arround them harvesting and packaging the vegetables their hands working in an amazing pace to rhythmic latin music. 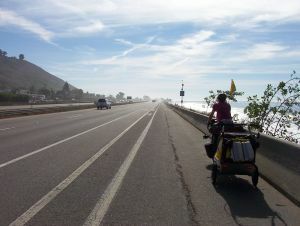 Santa Barbara and a bike lane on the interstate! The bike lane is actually the third lane from the right! 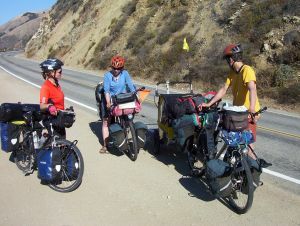 We left the coast for a few days and came over a 650m high pass back to the Pacific into Santa Barbara. And as promised by various travel guides, temperatures were much nicer from now on. We didn’t need fleece jackets in the evenings anymore. November felt like early September, but neverthless the days for us ended with the sunset and by 7 o’clock we were closing the tent zippers behind us, ready for sweet dreams. RV’s camping right next to the road paying as much as in a State Park. Maybe for a good surf? Now we didn’t leave the white beaches and palm trees anymore. There was no beach without surfers. Our riding days were now short. We were waiting for some mail sent to warm shower hosts in Los Angeles and didn’t want to arrive there too early. So we could spend a lot of time at the beach playing and jumping the waves. The only problem was, that we weren’t supposed to arrive at the hiker and biker campsite before 4pm and we were only allowed to stay one night. We didn’t care too much and arrived at the sites between 10am and 4pm and were only once asked to please follow the rules next time. From a nice State Park at the beach we climbed a small hill and passed the roadsign: Malibu. 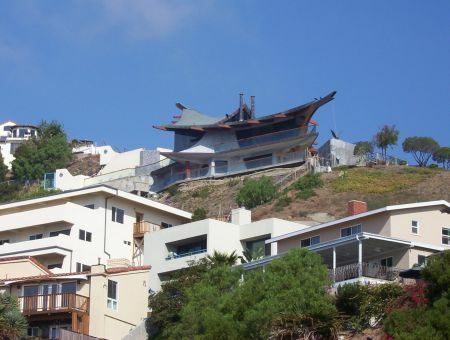 From then houses lined the highway. 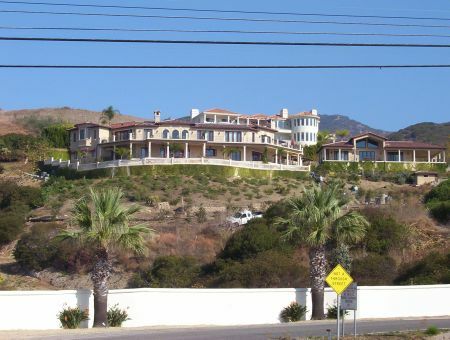 Big houses, huge houses; somethimes wall on wall, sometimes surrounded with quite the property. How many people live in such a house, we asked ourselves. The highway had good shoulders most of the way and riding was astoundingly pleasant. 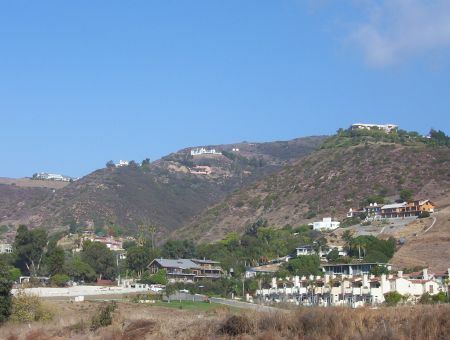 There was only a short stretch with no shoulder and lots of traffic riding through the center of Malibu for a few miles and then a bike path strated right on the beach which brought us to Santa Monica. There at a beach coffee shop a lady wanted us to make a life tv show out of our journey. Well, so far we haven’t met the right camera man yet. Santa Monica was pretty snoby, rich and a bit boring down on the beach. Venice seemed to live much more with a diversity of people using the beach. Shops played music and cafe’s seemed homey. 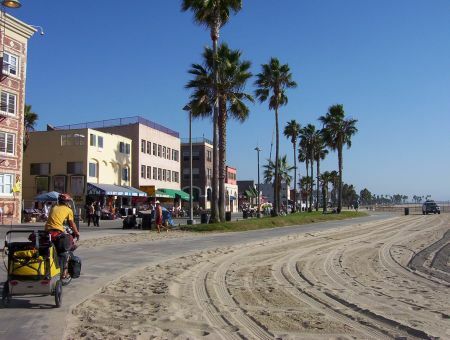 We stayed on the bike path all the way to Hermosa Beach with only one interruption and arrived at our host’s house shortly before it got dark. The last night in San Diego we spent with Andrea and Joerg, the german couple who, after two weeks car touring the South West had already caught up to us again. In the morning we all left for the same campground near the mexican border by Tecate. This last ride in the US was quite strenuous. The road of which we were warned so many times wasn´s too bad. But then we started to climb the hills into a strong head wind. This was slowing us down very much and tiring us out. A border patrol had stopped Andrea and Joerg in front of us and when we got to the site tried to make us turn arround too, warning us about a stretch to come predicting that we would get hit by a truck. 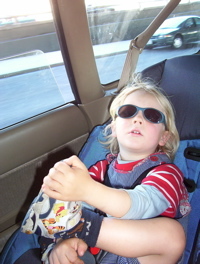 When he couldn´t give us any alternative than a route leading to an interstate in a huge detour, Flo and I headed on. we still had to cover quite some distance and it started to get late. Finally Andrea and Joerg came too after some hesitating. It was true, that stretch was pretty bad with traffic, but we didn´t get hit. But beause of the delay we had to ride a short strecht in the dark. That day we had climbed a total of 1700 meters. We spent the night 700m above sea level where it was freezing cold. The US has been very good to us. Thank you to all the generous people who helped us out, when we needed it! 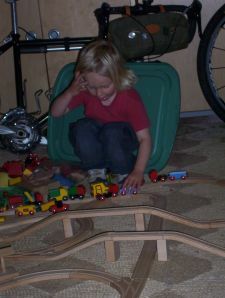 “Mama I want to draw!” Chan was shouting in his little house on wheels. “Ok! Your paper and markers are right next to you, do you need some help getting them?” I called back. 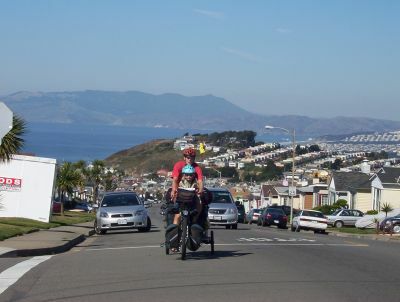 We were riding Legget Hill, a two hour uphill ride for us on Hwy 1. A windy road with no traffic at all – finally we were off Hwy 101 with its crazy traffic. Chan needed help and so we stopped at the side of the road. With paper and markers ready, he explained that he was going to draw a nice small and quiet road for us with no traffic, so that we could all enjoy our ride. I liked the idea and asked, if he could draw a really long road, so that we could have a nice ride all the way to Mexico. Then we continued to climb. On the top we needed some snacks and I opened the trailer to hand some trail mix to Chan. Chan was blue from face to toes! “I made a long, long. long quiet road for us.”, he explained. 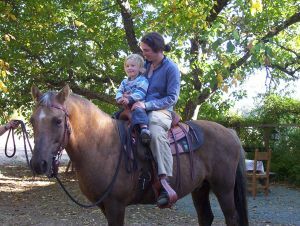 That day we rode over another hill, steeper than the fist one and a long downhill brought us back to the ocean. The beautiful warm sunshine and crisp air were a nice combination for riding. The landscape was beautiful too with its high bushy maiden grasses (miscnthus) sticking out of the dry and rocky ground. Happy excitement filled our bodies and we just wanted to keep riding. 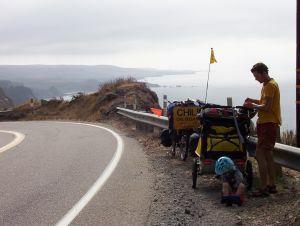 After the lunch break though the excitment and strength slowly ran out into the hilly coast line. 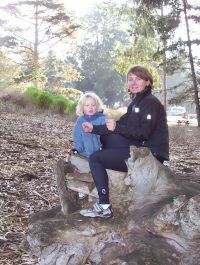 Tired and with aking muscels we spent the night on a State Park just outside of Fort Bragg. 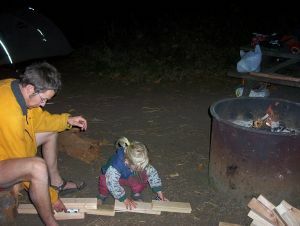 The night reminding us that it was fall, brought damp coldness to our camp. 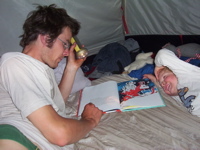 Next morning we waited for the tent to dry in the sun and then headed into town to contact Alex, a friend we had met five years ago on a freight ship from Europe to the US. Because we wanted to spend some time with her and she didn’t have enough room for us at her place, she had put an add on a local internet community board, asking for accomodation for us. 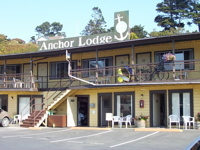 The Anchor Lodge hotel offered us two nights for free! 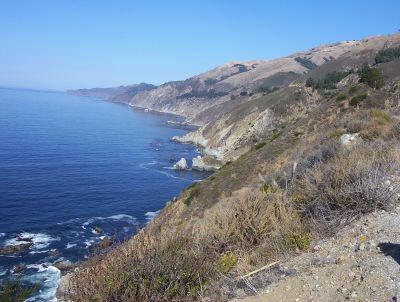 This part of the coast reminded us very much of Great Britan with its rough vegetationa and mild, windy climate. Alex showed us arround a little bit. So we went to Mendocino, a small character town with its many specialty shops and of course spent some money in a coffee place. 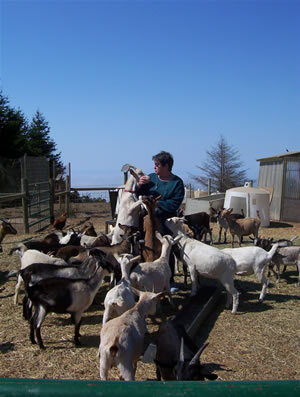 We also drove to the organic goat farm where Alex works. Chan wasn’t sure how he should feel about the goats and the big pyrenean shepherd dogs and finally decided that Daddy’s shoulders were the safest place to be. 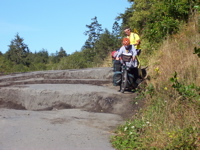 We had heard about the worst switchbacks of the Coast Bike Route and there they were! The road became steeper and steeper, but I could still push the pedals, up and up. 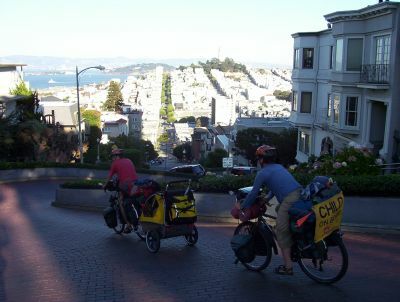 It got still steeper and I kept pushing harder, but suddenly , while pushing up, I lifted the front wheel into the air. Frightened I just managed to get off the bike without falling and then had to walk it to the top. Florian, who had the trailer was brave and went over to the center line where it wasen’t as steep to get arround the curve, lucky that there wasn’t any traffic coming at him. Hill over hill we made our way closer to San Francisco. In Pt. Reyes St. we stopped to check our e-mail, get some groceries and a coffee and a sweet treat from a bakery. 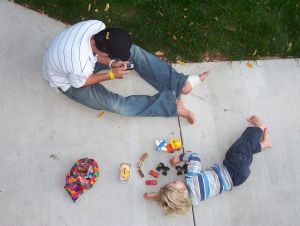 While Florian was in the bookstore finding out where we would be staying in San Francisco via Internet, Chan and I were waiting outside, watching people and playing. 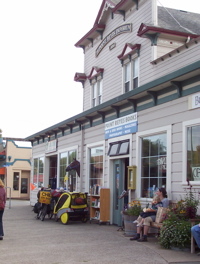 Then the owner of the bookstore waved us inside as well. Fascinated by our trip he let Chan pick a book and Florian didn’t have to pay for his internet use! 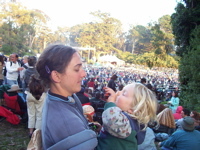 One more night we put up our tent before entering the S.F. Bay Area, one more time beneath redwood trees. 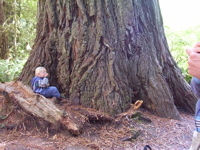 There was this beautiful circle of ancient trees and we put our tent in its middle. Early in the morning it sounded like raindrops falling onto our tent. Was it raining? We peeked out and found our tent covered in bird poop. Now we were finally riding towards the “big city”. Florian had arranged to meet with Jeff, another “warm shower” host we had contacted, at the Sausalito (the city north of Golden Gate Bridge) library in the late afternoon. From Samuel P. Taylor S.P. we had plenty of time covering the distance. Shortly before entering Fairfax though the trailer in front of me went: “BOOOMMMM!” One of the tires exploded. We had forgotten to check the trailer tires and one of them was completely worn through with big wholes and tears in it. Now what? Of course we didn’t have a spare tire with us. So Florian fixed the tube and I fixed the tire with duct tape! Luckily it had to hold for only about six more miles. “Fairfax has tons of bike shops!” one of the passing race bikers told us. To take the weight off the trailer Chan had to switch to his seat on my bike and slowly we made it to a bike shop. 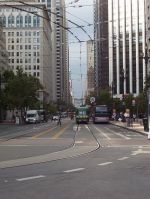 The ride through the urban jungle, that now followed was surprisingly pleasant. Lot’s of bicyclists were out and about, we had good shoulders and bike routes to lead us through traffic. Only once we got lost, but a very helpful race biker put us back on track. 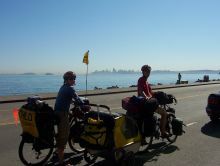 Finally a bike path brought us into Sausalito. In spite of the tire breakdown we still had plenty of time before we would meet up with Jeff. So we went to the organic food store and had a big late lunch. Then we met Jeff and he brought us to the docks. On the way he explained that he had two sailing boats, both out in the bay. He was living in one and we were welcome to stay in the other one as long as we wanted to. 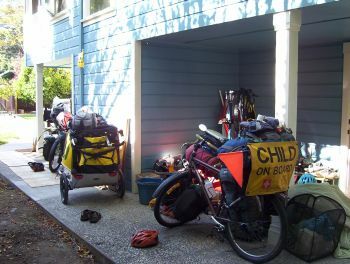 Now we had to figure out what to do with the bikes and the trailer. Jeff had friends owning a floating Restaurant Ship, where we could leave everything we didn’t need for the night. 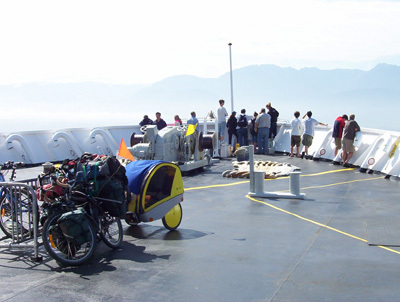 The trailer had to be emptied for carrying, the bikes unloaded to be pushed up and down the ship ramps onto a floating deck. Finally everything was stashed away and we got a ride out to the boat with Tim a local boat builder. 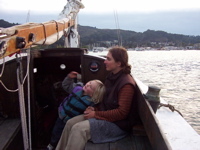 The boat was a tiny wooden 1950 sailing boat. Suddenly we had this totally different perspective of the city and the surroundings. Slowly the sun light faded away and thousands of others lit up all arround us. The motion of the boat created a peaceful feeling all arround. Chan was fast asleep within minutes on one of the tiny bunks while Florian, Jeff and I sat out on the cockpit chatting away, enjoying the specialty of our one night “home”. It was a one night adventure only. We needed to find another place to stay. 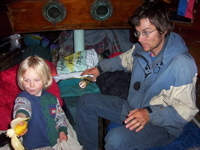 I had shared the bunk, not more than a meter wide with Chan, Florian had the other one. I felt a bit claustrophobic every time I woke up and it was still dark, I felt this urge to run, but there was only water arround us. In the morning Chan needed to move arround, but I had to hold him close, there was nowhere to go and run and play and I was afraid he would fall over board. Finally we packed the skiff Jeff had lent us and rowed over to his sailboat. Jeff took his kajak and showed us the way back to the docks. On land again we made some phone calls and wrote some e-mails to people we had met on the road further up the coast. We were hoping to find a more suitable place to stay for a while in the Bay Area. While waiting for Tim to get back to us to be taken to a friend’s place who had invited us to stay for a night, Florian played with Chan on a playground and I went to the bike shop. I was looking at bike mirrors when someone called:” Rebekka!” Peggy came up to me saying:” I was just looking for you! How are you? You can stay with us, our house is small, but we can make it work!” Peggy was one of the people we left a message on the phone. 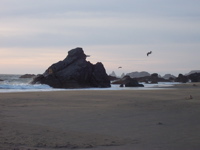 We had met her in Florence, Oregon, and spent the night together. 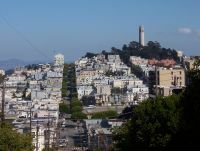 She had given us her phone number and encouraged us to call once we arrived in the Bay Area, since she lives in Mill Valley with her family. 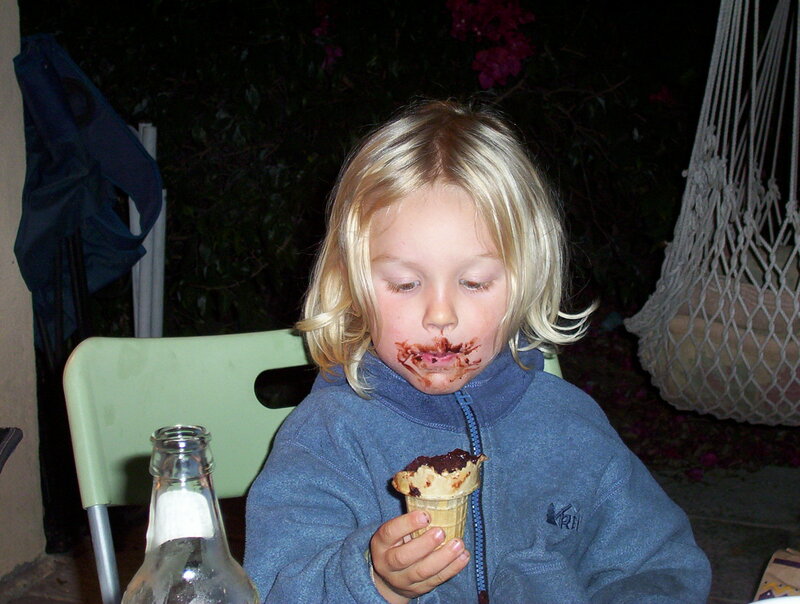 And that’s how we ended up staying with her and her family in Mill Valley for a week already. Tyler, Peggy and Michael’s oldest son is racing bikes and so he has a little bike work shop set up which we can use to fix up our bikes again. Chan loves the family so much. Here he found two brothers and a sister who are beautifully playing with him. In the past week he has made huge progress with his english speech using lots of new words and making real sentences now. 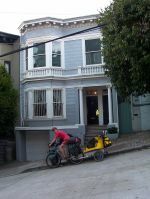 Florian’s friend Felix had brought our new trailer to San Francisco while on a family visit. Chan already climbed in and out declaring it to be his. But what surprise the hitch only fits my but not Florian’s bike. So we contacted the manufacturer, who is now sending us a special piece for Florian’s bike. 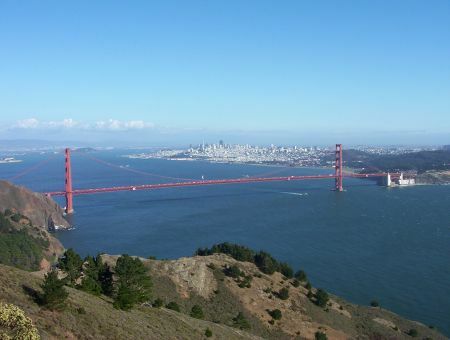 So we will be staying in Mill Valley for a few more days, waiting for the piece to arrive and thus have more time to explore San Francisco and visit with our old friends Becky and Dave. It has been quite a while since the last update and some 800km filled with encounters and stories waiting to be told. But where should I start? 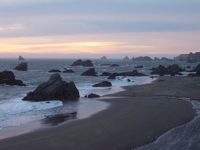 Well, southern Oregon, Harris beach S.P. just outside of Brookings was our last stop before entering California. At the campsite we found Thomas and Marianne’s tent (swiss couple we had met before) and were looking foreward to some more chatting in Swiss german. 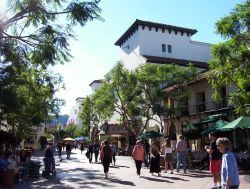 We had arrived early and went for a bike stroll into town to look for the Visitor Information where we wanted to pick up the official Highway map of California. As it turned out, the Visitor Information was just across the street from the Park and we had missed it! Back at our camp we got ready to cook dinner, when more and more cyclists turned up and set up their tents. They invited us for dinner with them. 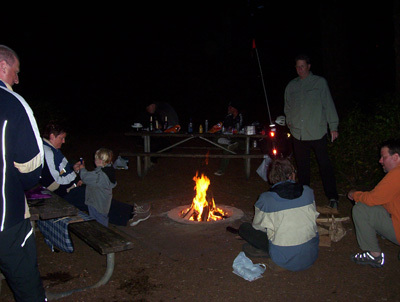 At a nice camp fire we shared corn on the cob, baked potatos, wine as well as biker stories. 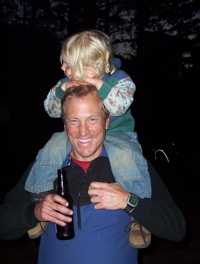 Chan had a blast taking Randy, one of the other bikers, by the hand, pulling him all over the hiker/biker site and finally riding on his shoulders. In Brookings we had to replace Florian’s back rim, which had some small cracks. The mechanic showed Florian the inside of his wheel (the cracks were a known problem to him for ths particular brand), where some of the cracks went over 4 spike wholes! Lucky Florian that they didn’t collaps the rim while we were riding! We had been warned several times about an inspection station at the border to California where all fresh produce would be collected. It is prohibited to bring any fruits or vegetable into California because of a fruit flie plague some 30 years ago. So we ate our last fruit a few 100m before entering California, but what disappointment: The inspection station was closed! After Crescent City Hwy. 101 led us on a steep windy road up into the redwoods. And that’s what it sounded like for us: “Truck! Auto (car), auto, auto… ui, ui! 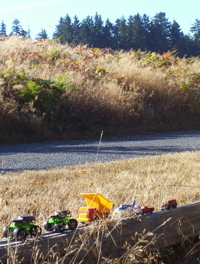 (Pause) Achtung (careful), Achtung, logging truck, schnell drab, drab (move over)! (Pause) Auto, Truck schnell (fast)!” Florian’s back mirror was broken and so I was warning him about traffic in our backs. 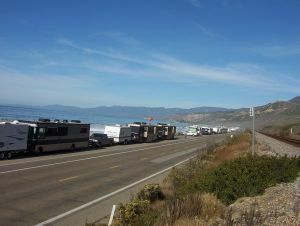 The further south we got the busier 101 was and somethimes it even turned into a freeway, shoulders coming and going! We took every chance to get off that 101 onto smaller back roads. 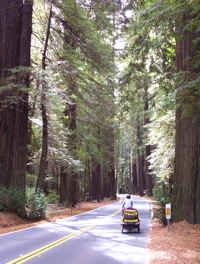 Beautiful was the ride on a Redwood National Park road closed to commercial traffic and with a 45 m/h speed limit! 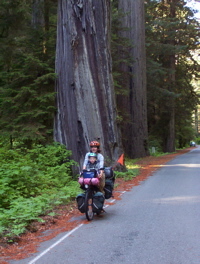 The trees lining the edge of the road were some of the oldest redwood trees left. 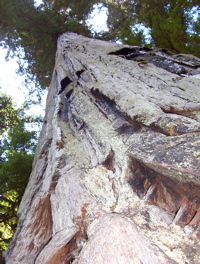 Huge are some of the trunks and how small we were next to one of these giants who can reach up to over 100m into the sky! So far we weren’t very successfull in repairing Chan’s trailer. Arcata was the place we wanted to get it done. Randy had introduced us to a website where bicyclists offer “warm showers” to each other. 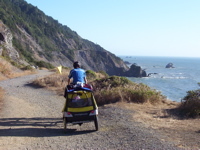 That’s how we found Sandy and John, hosts close to Arcata. They served us a delicious dinner and helped us finding a place that could fix the trailer. The next day Chan and I spent at the Arcata food coop (organic and local) while Florian was working with a mechanic on the trailer in a car body shop. Late in the afternoon we headed out of town and for the first time asked people again for a spot in their back yard to put up our tent. I got a glimps of kids trailer in a back yard and that’s where we stopped to ask. “Of course, come on in!”, said Greta, mother of two small kids. 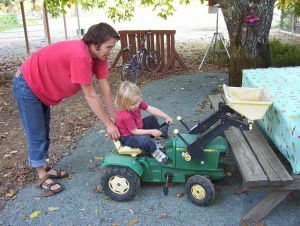 Her backyard was full of toys, there was a huge gardening space an apple tree, goats, chicken and a dog. Chan quickly found his way to the toys and played with the kids while we were setting up and cooking dinner. 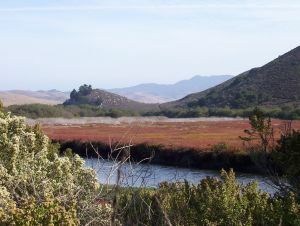 We were turning our backs to the coast for a while now, following the Eel River along the Avenue of the Giants. What a relief to be emersed in the green quiet of these ancient trees, away from the noise and busyness of 101. 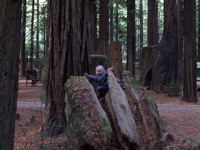 Chan loved our campsite in the midst of the redwoods climbing on old stumps and drumming away with fallen branches. Garberville! That’s where we finally decided to get a new trailer. We think that our trailer has some weakness in the design and that it would therefore be only a matter of time until the next crack, once on gravel roads in Central and South America. It would be a lot harder to repair or replace the trailer after crossing into Mexico. So we went to an internet cafe (one of the rare once since Canada!) and sent out a few messages ordering the trailer from a german company and organizing its way to us via a friend of Florian’s. 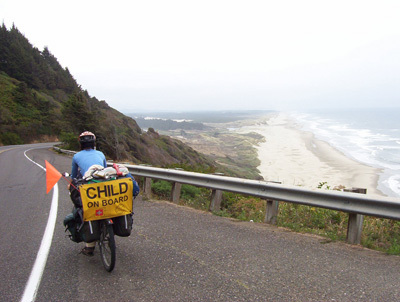 “Oregon’s coast bike route is wonderful!”, people told us. “You have nice shoulders all the way through and the route is signed out. 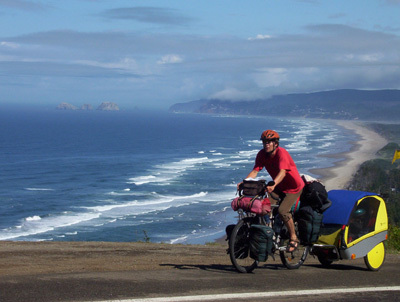 There are plenty of campgrounds with cheap hiker/biker sites and free hot showers. And the views are breathtaking!” Well, most of it turned out to be true. A 2 1/2 mile bridge was the entrance to the Oregon Coast. 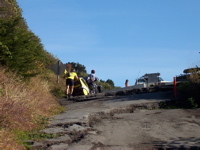 We were lucky to ride over it on a sunday (no trucks) and with very little wind. 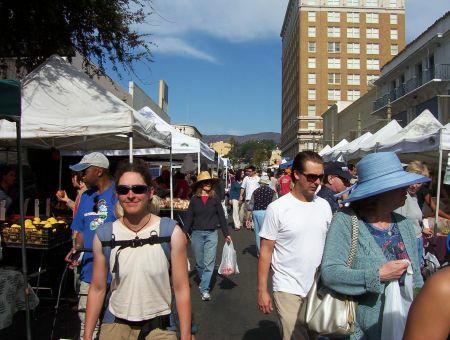 On the other side was a farmers market awaiting us. 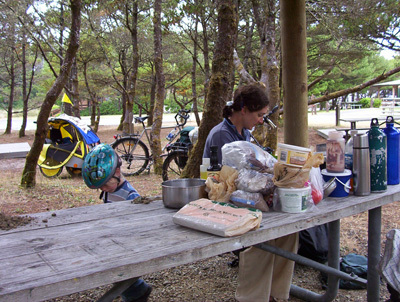 We filled up on fresh produce and bread and then headed for the close Fort Stevens State Park. For a long time already we had promised Chan sand beaches to play on. 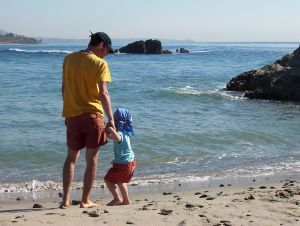 It was a beautiful warm day, but still we went for the lake beach, the ocean winds were too strong. At the hiker/biker camp we met three other bikers from Utah which we would be meeting at the next few campgrounds again. 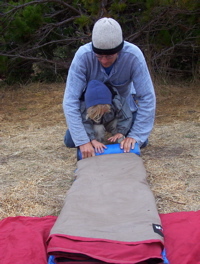 With loads of campgrounds along our route, we now wanted to take our time and have mor e playtime for Chan. After a short ride, a coffee stop and purchasing a new kite we diceded against our first plan to ride to a further campground. We still had the whole of the afternoon time. After a few hills we were ready for the State Park to appear and finally there was the sign. But how disappointing to discover, that there was absolutely no vacancy. It was already late now. There was another big hill between us and the next campground. Trying to deside if we should just pitch the tent on the steep forest slope or ride for another hour, some other bikers turned into the parking lot. Hey they have the swiss flag on their bags! Hello! 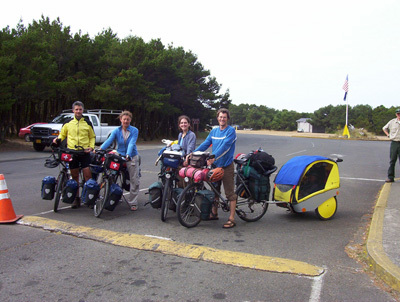 Rahel and Joerg, a swiss couple, are on the road since April this year. 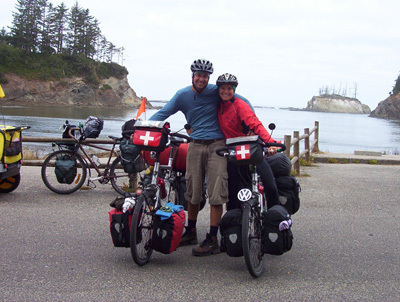 With a similar dream to ours, they already pedaled up to Alaska and are now exploring the Westcoast on their way to South America. Needless to say, that we had a lot to talk about. 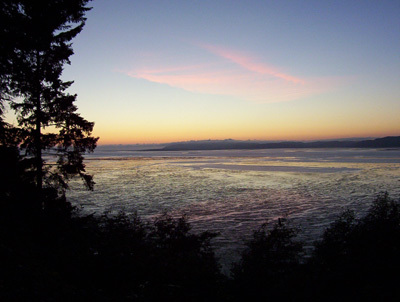 We decided to all ride over that hill, which rewarded us with a breathtaking view of the shore in the evening light, to the next campground. There the three bikers from Utah had already made their camp and one of them filled up our bottles with water to help us out a bit. 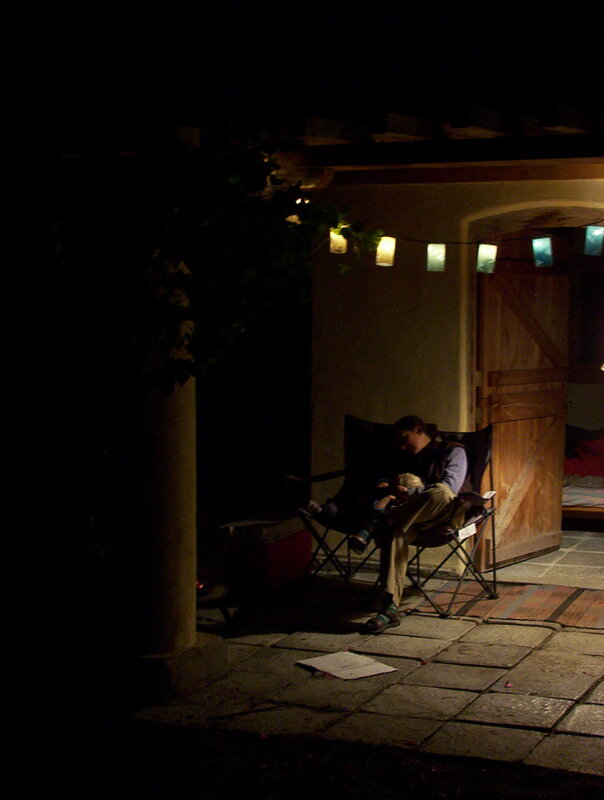 Late into the night we sat a t the table and talked, compared our equipment and drank hot tea. Chan fell asleep on Florian’s lap while playing to be a baby. After a late breakfast we arranged to meet up at another campground in the evening. Then Rahel and Joerg took off, beeing a lot faster on the road than we are with the trailer. We really enjoyed the few days we travelled with Rahel and Joerg, but our pace is a lot slower and so we said goodbye, needing a resting day while they went on southwards. Although Chan is doing really well with potty training, he still goes through a lot of pants and clothes. It is amazing how quickly he can be covered with dirt from toes to the tip of his nose. 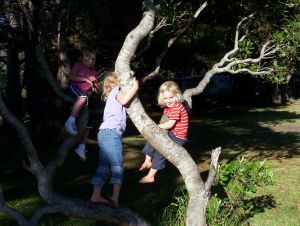 So we needed our laundry done again, beach play time and internet communication. A day later we couldn’t find our little bike computer, telling us speed and milage, anywhere. So we finally left the campground without it. That evening I went through all our bags one more time and finally found it in the first aid kit! How it got there? I have no idea. But while searching I found something else I’d rather not have discovered: A crack in the bottom shell of Chan’s trailer! Labour day weekend was coming up. No chance to find an open bike shop. So we took it slow to reach Florence, the next bigger town Monday night. 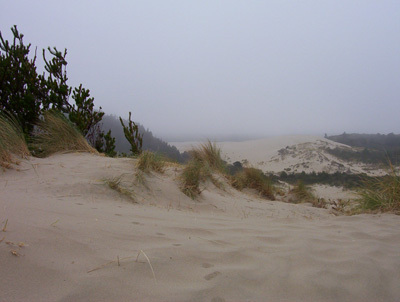 The ride was beautiful along rocky cliffs or huge sand dunes. We saw a gray whale feeding in a bay and sea lions resting on sunny rocks. 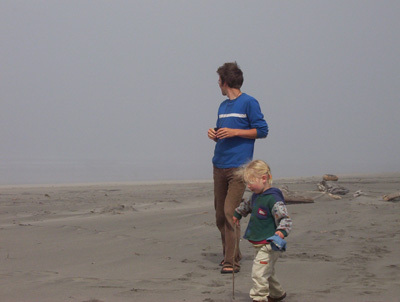 The mornings were usually quite cold because of strong winds and thick fog rolling in from the ocean. By midday the sun would usually break through and warm us up. On every hiker/biker camp we stayed, we met more bikers, on the road for different journeys, leaving us behind, telling us about others that will probably soon pass us. Some Americans, some from New Zealand and another couple from Switzerland. 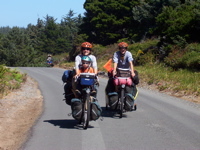 Thomas and Marianne are on the road as long as they have money and fun riding their bikes. Twice we met them on a campground and just today they continued southwrds, while we stayed in Bandon to enjoy a Cranberry Festival. Our route through Oregon was amazing, as people promised us landscape wise. 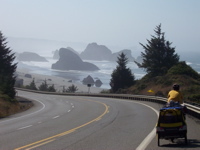 The Oregon bike route was a bit disappointing for the shoulders come and go and traffic commercial as well as recreational is quite heavy and at times pretty aggressive. Altough most cars are passing carefully we had some adrenaline boosting situations every day: logging trucks passeing very close in full speed, cars honking right next to us or cars passing from the opposite traffic lane, coming right at us while we don’t have any shoulder to give way! Neverthless it is good to be on the road again! Our challenge right now is getting the trailer fixed, which might end up in buying a new one. If anyone knows of somebody travelling from Europe to the US (hopefully San Francisco), willing to take parts of a trailer or a new trailer for us along, please let us know. It could save us shipping cost. Victoria was our last place in Canada, wrapping up our last paper wokr before leaving Lars’s place and heading to the ferry to Port Angeles, USA. Of the first people waiting to go through US customs, we were the last one’s bording the ferry because the officer kept asking Florian questions. Questions because he didn’t have a return flight and because we couldn’t show any proof of our safeings in Switzerland. 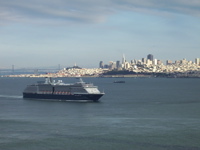 Then the ferry horned for its departure. The officer said: “You have five minutes.” But she still kept asking more questions about Flo’s profession and then mine. Then she put the wrong date on our papers twice. Finally she let us go. On deck, the ferry slowly left the port of Victoria and we looked back at our home for the past four years. Port Townsend was our next stop where we met up with Liberty, an old room mate from Vancouver. We camped at a beach, hanging out for one day. The next few days were longer riding days. Now we were anxious to make some distance south wards. 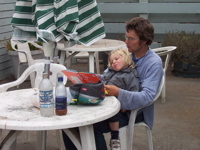 Chan was quite patient, a good travel mate, choosing his times in the bike seat and the trailer. Altough somtimes the days were long for him and he needed much attention and playtime with one of us in teh evenings at the campsite, while the other put up the tent and cooked dinner. So far we’ve been lucky with the weather, sometimes though I wish, the wind wasn’t quite as cold. In Shelton, WA, we stayed in a motel for the first time. That town, although county seat and the biggest in the area, didn’t have a campground. But we needed our laundry done and wanted to put some updates on teh blog. But there was no i-net place either and the library had access only for 30 minutes not allowing to upload pictures. For the first time on this journey too, we were invited for dinner by a woman, Debbie, who overheard Flo talking swiss german to Chan. 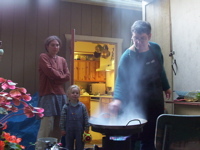 She served us home made quiche and showed us her family’s home with goats, sheep chicken and geese. We left Shelton on a nice and quiet backroad against the advice of Debbie’s family. It was one of the best roads we travelled in Washington State! 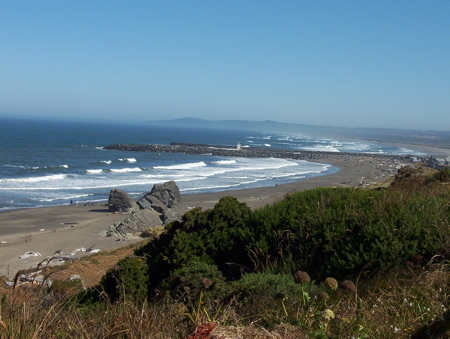 At least we reached the Pacific Ocean at the Cape Disappointment State Park in the very southern tip of Washington. We took a day off biking and enjoyed the beach. In the morning, thick fog hid the big water under a white blanket. The waves looked scary and wild. 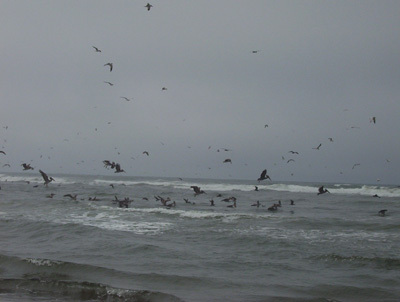 Seagulls and Pelicans were waiting for their catch in the sand. Finally the sun unwrapped the beautifull coast and Chan had a blast running at the beach with Florian and flying his kite. 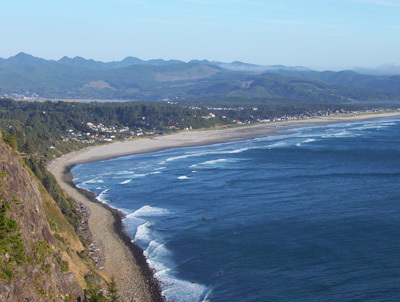 Our next stretch will be the Oregon coast which is supposed to be amazing and a ciclyst’s dream.